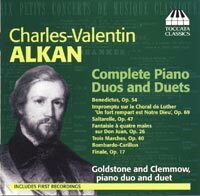 CHARLES-VALENTIN ALKAN (1813-1888): Complete Piano Duos and Duets - Benedictus, Op. 54, Impromptu sur le Choral de Luther "Un fort rempart est Notre Dieu", Op. 69 (both transcr. 2 pianos Roger Smalley [b.1943]), Piano Duet: Fantaisie à 4 mains sur "Don Juan", Op. 26, Saltarelle, Op. 47, 3 Marches, Op. 40, Bombardo-Carillon, Finale, Op. 17. Description: More of Alkan's trademark energetic eccentricity and wit are on display in the complete duos and duets while the more solemn side of the composer is heard in Smalley's two-piano transcriptions of works for pedal piano. Nine pages of notes by Malcolm MacDonald make this a real luxury item for Alkan collectors! Goldstone and Clemmow (piano[s]).